Meanwhile UK cities are putting forward their own bids to host the new Channel 4 HQ, with Glasgow, joining a list that includes Birmingham and Cardiff the latest to throw its hat into the ring. The significance of this goes beyond direct economic benefits (new job numbers are likely to be in the low hundreds); more alluring is the chance to write a new narrative for themselves, and tap into Channel 4’s indie image. This has seen cities promote their ‘edgy’ credentials, and demonstrate the creative atmosphere needed to attract new companies and talent. Nonetheless, these contests can provide a distraction from the more mundane, but more important, question: how can cities attract companies who don’t launch competitions or invite bespoke websites? After all, Channel 4 wouldn’t be moving at all if it wasn’t being strongly pushed by government. London and the South East is still uncritically assessed as the obvious destination for many high-end businesses. What, then, can other cities do? Regional cities face a lot of hurdles to becoming business hotspots. Not enough power given to city governments. Infrastructure that is ageing, if not ancient. Competitions to ‘win’ funding that was previously taken for granted, then taken away. However, there are reasons for hope. A recent talk by Bruce Katz, hosted by Centre for Cities (and attended by this author) drew attention to just how much wealth cities have at their disposal, if only they would recognise it. True, it often isn’t found in council coffers, but when local businesses, universities, and charitable institutions are considered, as well as the current and potential value of land, you have a lot more to play with. You also have a wealth of expertise, held by individuals with strong personal affiliation to the city. Those cities which, by whatever means necessary, get these stakeholders working towards common goals, can become ‘problem-solvers’. This creative leadership signals to business that a city is a place that is going places. Since Leeds and Greater Manchester were announced as pilot City Regions in 2009, the Leeds City Region (which includes Bradford, Harrogate, and York) has seen its rate of business births increase by 59% from 2010 to 2016 . This is impressive, but falls behind the 121% increase seen by the Greater Manchester area. Many factors are at play, but it is reasonable to assume that the leadership shown by Greater Manchester as part of its devolution process, which has taken in a broad spectrum of stakeholders, has played a large part in businesses deciding to start up there. A quick glance at the Amazon wish-list (or “Key Preferences and Decision Drivers”, in the language of the tender document) reveals two big-tick items. The first is financial perks, with “Capital and Operating Costs” and “Incentives” coming high on the list (politely inviting cities to bid away any benefits in tax breaks and subsidies). The second, though, is quality of local education, particularly the university system. This is helpful for cities and towns across the UK; high quality university education is distributed across the country. 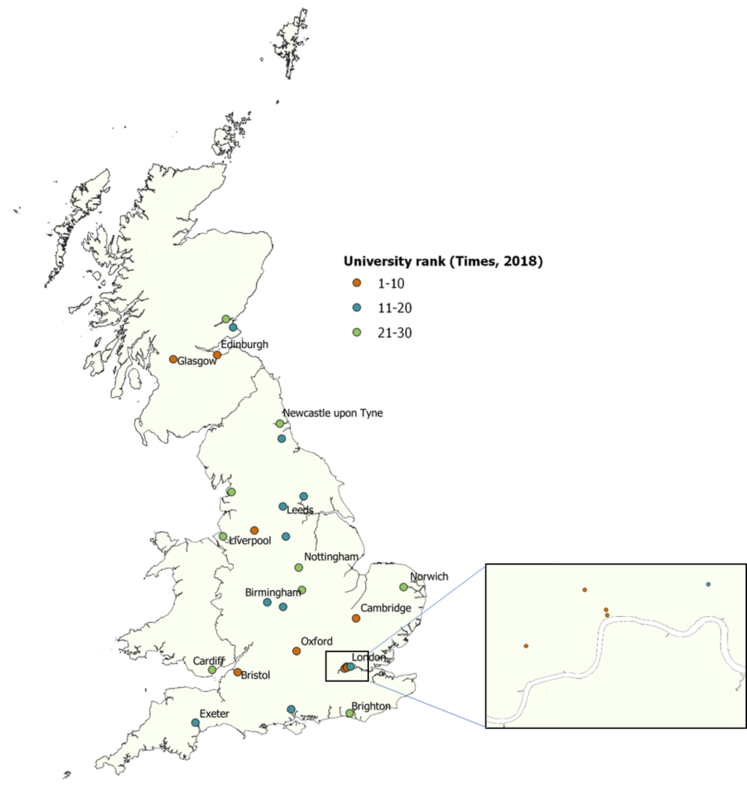 When considering how to attract business, regional cities will do well to start with their university. If the university is highly regarded, the city will bring in businesses, looking to tap into graduate talent. And that may not be the only area where councils can collaborate with universities to improve the prospects of the city. In Edinburgh, for example, the University of Edinburgh has been heavily involved in negotiating heads of terms for a City Region Deal, and is leading the push for Data-Driven Innovation in local industry. In Gloucestershire, the University of Gloucestershire is holding the conversation about placemaking and the future of the county. Newcastle University and Northumbria University have both been at the forefront of supporting the North of Tyne devolution deal, the science central development is a major element of the growth strategy and the universities have also added their intellectual firepower to the development of sector bids for the local industrial strategy. The University of Cambridge has driven forward the growth of the IT and Life Sciences industry and collaborated with the local authority in transforming the city’s use of space. There are other creative partnerships, such as that between Blackburn Council and its Cathedral to create a new high-end restaurant and office development. One stumbling block in a lot of cities is that, while local business and university leaders are likely to have been around a long time, local government leaders regularly change places – the Government Office for Science finding average tenure among city leaders to be 4.7 years, and over 60% of current leaders having been in post less than three years. If ‘soft power’ and networks are as important to city success as Katz thinks they are, the transitory nature of local government power could be hindering co-ordinated efforts to become attractive to business (of course, much of this stems from local election cycles). This is one of the main arguments for Metro Mayors, as stable, visible figureheads who can give long term assurance about the direction of travel of our main city regions. At the same time, there is a great need for businesspeople and university directors to recognise themselves as what they already are: part of the city leadership. They shape views of the city for those who live both outside of it – signalling whether it would be a good location to be based in. This move towards cities solving their own problems through collaboration across networks is already happening. Those cities which recognise that they (understood in the broadest sense as all of their stakeholders), and they alone are responsible for attracting business, will be able to bring new trade within the city boundary, even if the media attention is rather more muted than it should be.